Ahhhh Cairns was great, but I have to tell you about Classic Escape Holidays just in case you get approached by these guys. No, I wasn’t scammed and to be honest, it’s technically not a scam, however it certainly left us feeling like it was. What exactly am I talking about? 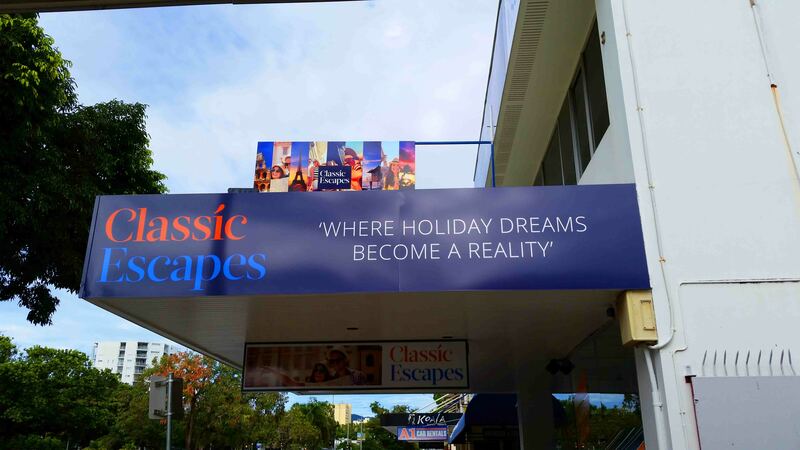 Classic Escape Holidays are basically a timeshare company. They want you to buy into a scheme, a room at a hotel or something similar that you can then visit for so many days a year. And you know, that’s fine as a business concept and I’m sure there are plenty out there interested in it, but it’s the way they look to recruit people to buy in on the scheme that left me feeling a little like I was nearly ‘scammed’. Naturally everything they do operates within the law and I don’t want to suggest otherwise, however it is easy to see why people would feel that they hadn’t really signed on for what they ended up getting. So, it all began in the shopping mall in central Cairns. The food court – I was there to check out the movie times, when my wife and I passed two people giving out ‘scratchie’ tickets for Classic Escape Holidays. One star you win a $50 voucher to something or other, two stars and it would be $100. So I thought ‘why not’. I scratched away and won nothing. Oh well. But I was there with my wife – she should have a ticket as well. One star! Two stars! OMG THREE stars! What did that even me that hadn’t been explained to us pre-scratch! We had absolutely definitely won one of three prizes. 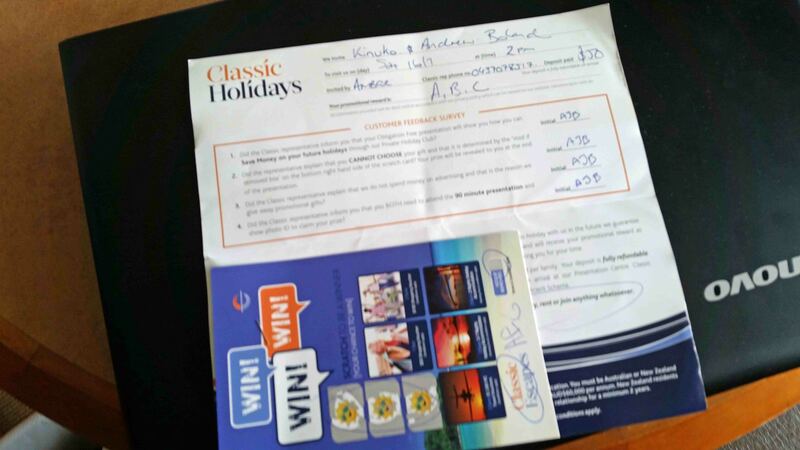 Prize A – a $1500 voucher to spend on whatever we liked at Classic Escape Holidays. Prize B – up to 7 nights at a resort in one of many locations around Australia and South East Asia. Prize C – return flights and accommodation for two nights to an Australian capital city of your choice. There were caveats with prizes B & C – there were ‘administration’ fees of $199 and $50 respectively. And there was more – seeming as how they were so nice to give us a prize, well, we needed to go to their office the next day and see a 2 hour presentation about the company. A naturally curious person, I thought from the get-go that this was all a little too good to be true, but yet wanted to see how it played out. After all, we hadn’t any firm plans the next day. 2pm then. Oh wait – we had to pay a deposit. That was to make sure we turned up I guess as we’d get it back the next day. So I’m not sure exactly what it was a deposit on. Now I was close to saying ‘no thanks’, but in the end we handed over fifty bucks and got a signed receipt. Of course the first thing I did that night when I had internet access was check out Classic Escape Holidays online. Well, it confirmed what I had pretty much suspected. The presentation was actually a ‘sell’ and a pretty hard sell too I gathered. For time shares. I looked through a few sites including Trip Advisor and everyone who wrote on it had won Prize B. That had an admin fee of $199, and the places appeared to be around $30-40 a night. So you would pretty much pay for all the accommodation any way. If you have to pay a fee I have to ask, is it really a prize? Some people took the prize and liked the place, some did and hated it, reporting that an additional caveat had been added when taking the prize that they sit through another presentation. It started to remind me of an episode of South Park where the parents took a free trip to the snow and spent the whole time listening to presentations! So we went to their office the next day, asked for the deposit back (which we got) and said ‘sorry, not for us’. There was no issue with that although I was told there is a lot of ‘misinformation’ on the internet. We never found out whether we had one A, B or C. My gut tells me it was B, and we would have had 12 months to use it which we probably wouldn’t have been able to. And so that was my little story. We didn’t get taken in the end. It was somewhat surreal. It always pays to check the net and remember – if something seems too good to be true, it probably is! May the Journey Never End! Oh man 😦 although it is not a scam, you really want to watch out these guys!! Wrrrrr thanks for warning! thanks for reading as always Agness! What a weird experience! I always give things like this a very wide berth – too good to be true, indeed. Ugh – we got roped into a similar scheme in Puerto Rico one year. Like you, we didn’t take the bait, but it was still so annoying!